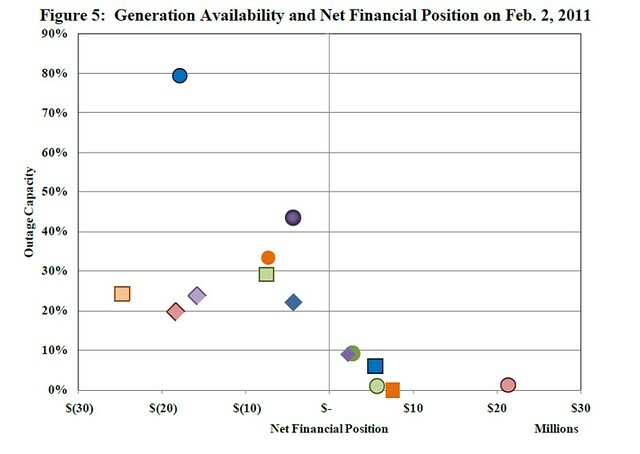 The ERCOT independent market monitor (IMM) has released its report on the February 2, 2011 rolling blackouts. Excerpts from the report introduction are below, but let’s get to the meat of the matter. The IMM was asked (1) whether there was any evidence that market participants tried to manipulate the market for financial gains during the period, and (2) whether markets operated efficiently and as expected during the period. The short answers are (1) no evidence of manipulation was found, and (2) the markets operated efficiently and outcomes were consistent with the market design. While these may seem like excessively upbeat conclusions given the failings in the ERCOT region that day, the key is to distinguish between the physical systems – which did fail and created significant hardships that day – and the market systems – which appeared to work as intended. The market review concluded market participants faced increasing incentives to have generation available before the event, companies responded to incentives by taking many preparatory steps (nonetheless, inadequate as we see in hindsight), during the emergency companies faced substantial incentives to bring generation to the market, and companies responded to those substantial incentives by engaging in extraordinary efforts to bring offline generators back online. The Texas Reliability Entity, reliability monitor for ERCOT, will also be issuing a report on the event directed at generator compliance with ERCOT reliability protocols and related rules. The North American Electric Reliability Corporation (NERC) and the Federal Energy Regulatory Commission (FERC) are also investigating outages in Texas and elsewhere in the Southwest and may publish reports. In the early morning hours of February 2, 2011, the Electric Reliability Council of Texas (“ERCOT”) region experienced extreme cold weather conditions, record electricity demand levels, and the loss of numerous electric generating facilities across the ERCOT region. These events combined to result in the declaration of Energy Emergency Alert (“EEA”) Level 3 at 5:43 a.m., with the initial interruption of 1,000 MW of firm load at that time, and reaching 4,000 MW of firm load shed by 6:30 a.m. Subsequently, firm load was restored in 500 MW increments beginning shortly prior to 8:00 a.m., with all firm load restored shortly after 1:00 p.m. on February 2nd . Prior to the declaration of EEA Level 3, load resources contracted to provide responsive reserve service were deployed at approximately 5:20 a.m., and Emergency Interruptible Load Service (“EILS”), another contractual demand response service, was deployed concurrent with the declaration of EEA Level 3, at approximately 5:46 a.m.
On February 4, 2011, the Executive Director of the Public Utility Commission of Texas (“PUCT” or “Commission”) directed Potomac Economics as the Commission’s Independent Market Monitor (“IMM”), and the Texas Reliability Entity (“TRE”) as the Commission’s Reliability Monitor, to investigate the ERCOT EEA Level 3 that occurred on February 2, 2011, and subsequent related events and developments on February 3-4, 2011, including all preparations leading to the emergency event, as well as action taken once the event occurred, and focusing on the actions of ERCOT and the ERCOT market participants to determine whether all appropriate laws, rules, requirements and processes were followed. The primary role of the IMM as the Commission’s market monitor is to: (1) detect and prevent market manipulation strategies and market power abuses; and (2) evaluate the operations of the wholesale market and the current market rules and proposed changes to the market rules, and recommend measures to enhance market efficiency. The primary role of the TRE as the Commission’s reliability monitor is to monitor and investigate material occurrences of non-compliance with ERCOT procedures that have the potential to impede ERCOT operations, or represent a risk to system reliability. Given this division of responsibilities, this IMM report addresses the following two issues related to the ERCOT EEA Level 3 on February 2, 2011 and subsequent related events and developments on February 3-4, 2011: (1) whether market manipulation strategies or market power abuses were a cause or played a role in these events; and (2) whether the operations of the wholesale market and the existing market rules produced efficient market outcomes. Based on our review of the cause of each generating unit outage and/or capacity de-ration, as well as the financial positions of market participants, we do not find any evidence of market manipulation or market power abuse in relation to the widespread generating unit outages that resulted in the EEA3 event on February 2nd . Given the system conditions that materialized on February 2nd and 3rd, we find that the ERCOT real-time and day-ahead wholesale markets operated efficiently and the outcomes are consistent with the ERCOT energy-only wholesale market design. Finally, because the review of the EEA3 event on February 2, 2011 is the subject of review by multiple entities and the IMM report is but one facet of this review, we have not at this time provided recommendations that may be beneficial in preventing a reoccurrence of the events experienced on and around February 2nd . We anticipate and are looking forward to participating in the development of a comprehensive set of actions that will serve to significantly improve the future reliable operation of the ERCOT grid in manners consistent with the competitive ERCOT market structure. I have no problem with the conclusions for the events of 2/2. It seems to me that a similar analysis of what happened one week later, during a similar cold snap would not result in the same conclusion #2.